We systemically report on a new method for producing reinforced poly(dimethylsiloxane) (PDMS) with superhydrophobic nanosilica. Firstly, we rationally designed to synthesize a series of well-dispersed hydrophobic nanosilica by using hexadecyltrimethoxysilane (HDTMS) as the treatment agent. Fourier transforms infrared (FT-IR) spectrum, thermo-gravimetric analysis (TGA), and contact angle (CA) measurement were used to characterize the grafting degree of HDTMS grafted onto the surface of nanosilica. Subsequently, we employed these modified hydrophobic nanosilica to further reinforce PDMS. 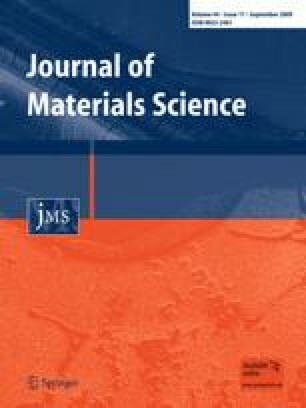 The properties of as-prepared modified nanosilica filled PDMS composites were thoroughly investigated by rheological test, scanning electron microscopy (SEM), TGA, and dynamic mechanical analysis (DMA). We have found that these as-prepared superhydrophobic nanosilica exhibit uniform dispersity in the PDMS matrix, and their composites exhibit good mechanical properties and obvious advantage on thermal stability compared with those of the pure silica filled PDMS composites. This work was supported by Natural Science Foundations (NSFs) of China (Grant No. 20576053, 20606016), NSF (NASA) of China (Grant No. 10676013), “863” Important National Science and Technology Specific Project (Grant No. 2007AA06A402), and the NSF of the Jiangsu Higher Education Institutions of China (Grant No. 07KJA53009).